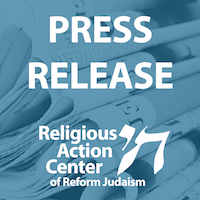 Today, the Reform Jewish Movement adds its voice to those calling on the Senate to reject the nomination of Judge Brett Kavanaugh to the U.S. Supreme Court. He has many professional and intellectual qualifications, but an examination of Judge Kavanaugh’s record makes it clear that his elevation to the Supreme Court would significantly jeopardize or adversely affect the most fundamental rights the Reform Movement has long supported. Rabbis Saperstein and Feldman: "The need for qualified and impartial judges transcends partisan discord and must be prioritized in order to uphold the highest values of our democratic system."